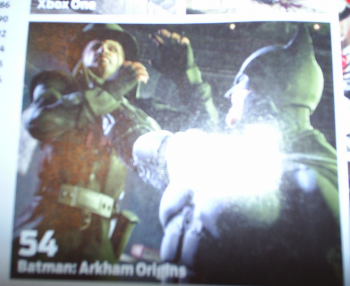 Thanks to an Official Xbox Magazine reveal, we know a little more about one of Batman's enemies. Batman: Arkham Origins features a host of villains both familiar and otherwise, all of them gunning for Batman, mostly at Black Mask's behest. However there's always time for a new character reveal, and this one comes courtesy of the Official Xbox Magazine, whose article was thoughtfully captured, in Photobucket form, and plastered up on the internet for all to see. We don't know exactly what this villain's deal is, but we know who he is: Jervis Tetch, aka The Mad Hatter, obsessive-delusional Carroll enthusiast with a yen for Batman's cowl. When last seen, in Arkham City, Tetch was more of a sideline than an actual threat. His psychoactive drugs made his sequence one of the more colorful fight scenes, but fight scene was pretty much all it was. He also had a very brief look-in, if you were collecting all the Riddler trophies, in Arkham Asylum. We'll almost certainly be getting a more in-depth reveal soon, so if you're wondering what the Hatter's up to this time, keep in touch. Until then, speculate! It does a body good. Batman: Arkham Origins is due for PS3, Wii U, Xbox 360 and PC in October 2013.